Whenever I feel I have seen the last of vampires or zombies or werewolves, somebody comes along and does something fresh and clever with those beings. I have written about this before, but its extremely relevant to the point I want to make tonight. There are some horror subgenres that continue to produce wonderful product year after year. I often wonder to myself if there is something special about certain characters or tropes compared to others. I feel like in 1973, "The Exorcist" was the end-all, be-all on the exorcism film. The sequels were trash, and nobody else has even come close to touching the intensity and disturbing aurora of "The Exorcist." Some have made decent exorcist movies (see The Last Exorcism), but nobody has touched the masterful power of "The Exorcist." I think I can say the same about "Jaws." In 1975, "Jaws" created the blockbuster, showed us that horror films could be box office powerhouses, and set a new standard for the shark movie (if there was ever a standard to begin with) that nobody has been able to touch since. "Open Water" tried, but failed miserably. "Deep Blue Sea" tried, and failed even more miserably. Much like with "The Exorcist," the sequels to "Jaws" were pretty bad. There has not been a single shark movie that has touched the intensity or the disturbing aurora of "Jaws." Still in 2017, "Jaws" has still not been beaten, because "47 Meters Down" is another forgettable shark movie. The story is simple, Mandy Moore and Claire Holt play sisters who are on a vacation in Mexico, and Holt tries to convince her older sister to go diving in shark invested waters, just to see what its like. Matthew Modine and some Mexicans lead them into the middle of the ocean and stick them in one of those safety cages. By complete chance, the cage breaks and the girls go sinking to the bottom of the ocean, in shark invested waters, with limited oxygen. Who are the character names? Who cares? Its not important. 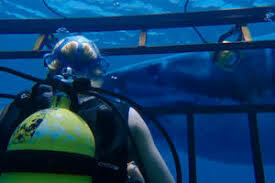 Both sisters will learn valuable lessons while trying to stay alive in the waters with the sharks. The only thing important is that we have two good-looking leads to wart off the sharks. Why use character names at all? This is a thriller with no thrills. A horror story with no scares. The music doesn't create any type of intensity or set up any mood. Every character, every scene, every theme is used for no other reason but to go with the motions. "47 Meters Down" feels like every other shark movie, but its completely devoid of any type of energizing juice, nothing exciting happens. Its just an hour and a half of girls screaming and hyperventilating. Sharks can be scary creatures. I would personally be nervous being underwater with sharks. But when a movie makes sharks campy, funny but not scary. Then something has gone very wrong. Its a movie about how precious life is, but is completely lifeless.